The obverse of the 2012 Australian Koala Silver Coins contain the Ian Rank-Broadley effigy of Queen Elizabeth II of England, along with a face value inscription of AU$1. 1 أوقية 2012 من العملات الفضية للكولا استرالية The reverse of this issue is an image of an adult koala sleeping on the branch of a tree with its front arms stretched around that branch. This design was created by The Perth Mint artist Aleysha Howarth. 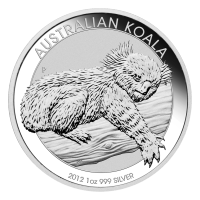 Reverse Inscription includes AUSTRALIAN KOALA, 2012, 999 SILVER and the size. The obverse of the 2012 Australian Koala Silver Coins contain the Ian Rank-Broadley effigy of Queen Elizabeth II of England, along with a face value inscription of AU$1. Each coin is guaranteed for weight and purity by the Australian Government and is considered legal tender of that country under the Australian Currency Act of 1965. These coins will be shipped in original mint sealed cases, however the packaging may vary from the typical capsules depending on product availability. This coin comes with a capsule case.